You are here: Home / Reviews / Optics and Sights Reviews / EOTech 300 AAC Blackout Holographic Site – Coming Soonish! The EOTech XPS2-300 features two 1 MOA dots positioned inside a 65MOA circular reticle. We had the pleasure of spending the past few days at the 2013 Professional Outdoor Media Association annual conference in Columbia, South Carolina. One of the joys of the annual POMA gathering is spending quality time with corporate members like EOTech. Away from the bedlam of SHOT Show or the NRA Annual Meeting, there is opportunity for lot’s of questions. Even better, the range day event allows more leisurely trial of new products. One of this year’s range day highlights was the new EOTech .300 AAC Blackout holographic sight. On the outside, it shares primary features with other XPS models. The EOTech 300 AAC Blackout reticle looks something like this. For example, it uses a sideways mounted CR123 battery. There are two reasons for this. The sideways mount helps to shorten the overall length of the optic – handy for AR platforms with limited rail space. 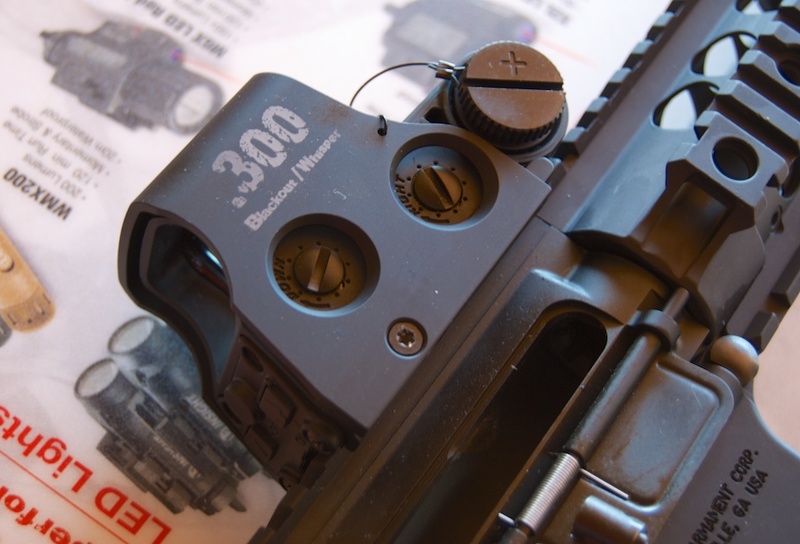 This is especially important if you also want to mount a magnifier or backup iron sights. The hidden benefit of the sideways mounted battery is increased resistance to adverse recoil effects. As the rifle fires, the battery does not move back and forth against the battery contacts. The result? Longer life and improved reliability. Clever. The XPS2-300 model also features rear mounted on/off and brightness buttons. This is primarily for true ambidextrous operation. Windage and elevation adjustments are 1/2 MOA, or about 1/2 inch per click at 100 yards. The real deal with the EOTech 300 AAC Blackout is the multi-dot reticle. Like most other EOTech models, there is a 1 MOA center dot. With the XPS2-300, there is a second dot below the first. This is intended for an additional range zero with the 300 AAC Blackout cartridge. The idea is that you choose either subsonic or supersonic 300 Blackout loads and establish two range points corresponding to the two dots. For example, most 300 Blackout subsonic rounds, if zeroed at 50 yards, will have the lower dot corresponding to 100 yards. In all likelihood, supersonic rounds will match the top dot at 50 yards also and depending on your specific load, you can establish a range that corresponds to the lower dot. Or, with the wide variety of 300 AAC Blackout loads, you could zero the upper dot for your choice of supersonic load, then determine the range for your choice of subsonic load sighted with the lower dot. This will be a fun optic to experiment with if you’re a reloader. The EOTech models for .223 / 5.56mm also have a 7 yard aim point. This is where the bottom post intersects the 65MOA circle. 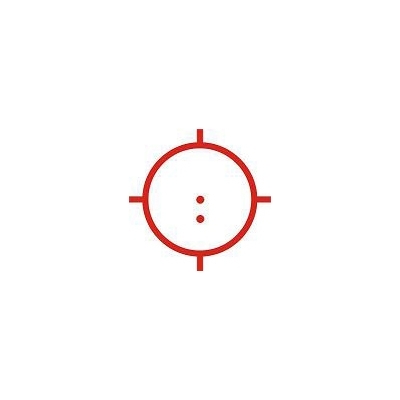 This aim point should also apply for the 300 AAC Blackout optic as there is minimal trajectory influence at just 7 yards – most of the difference between aim point and point of impact is a result of the height of the center dot over the barrel. We weren’t able to test this, but it should be pretty darn close. We’re anxious to get one of these in so we can experiment with a variety of both subsonic and supersonic loads and report on the reticle function. According to EOTech, the unit will be out sometime in the late spring / early summer of 2013.